The difference in construction is evident, as is the execution. Marvel’s successful model of single hero movies and then Avengers movies is most likely the thing that allowed Disney to purchase Lucasfilm, which is working on a similar structure – with a single character movie one year and a trilogy movie the next. Each of the individual films has had its own story and develops the character in their own right, but adds in enough easter eggs and shared detail to let you know that you are looking at the same universe. Some of the things that link the different stories aren’t obvious, and the fans lap this up – they foreshadow coming developments marvelously, in the same way that Star Wars has done, since it rebooted. Marvel have also successfully built a TV universe around the cinematic universe, and it is all connected – dovetailing nicely. It takes a lot of vision and a lot of great management, and perhaps a little bit of luck. Kevin Feige is the President of Marvel Studios, and the producer of all these movies, and they are moving forward with great new additions to the movie canon – this being the year of Black Panther, as well as Avengers: Infinity War. Or maybe it’s the year of Thor, if you look at the critical commercial success Thor: Ragnarok has been enjoying. 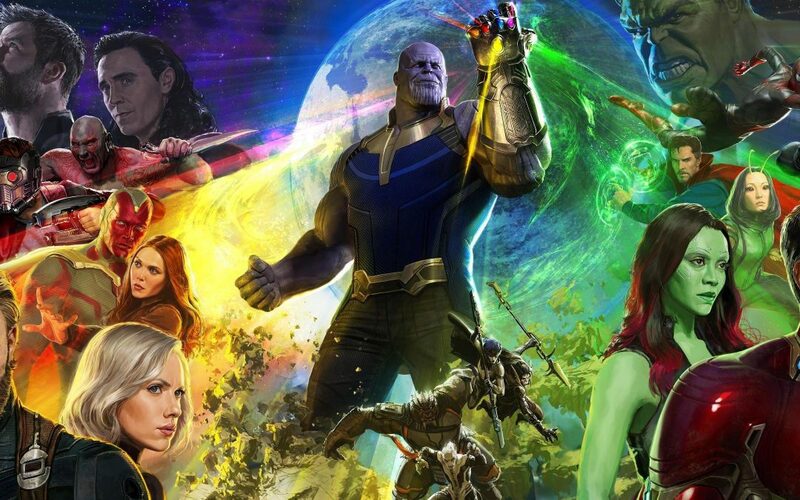 This outing for The Avengers represents a milestone though – the Marvel Cinematic Universe is ten years old; this is the movie which all the clues have been pointing towards, and according to Feige everything in their roster, and there are currently 20 more films on the slate, is going to be divided into pre- and post- Infinity War. the only real loose end is the X-Men, who have been served very well on the big screen, but whose copyrights are held elsewhere. Now to look at DC one wonders what exactly their problem is. Batman did great with Christopher Nolan at the helm. Superman hasn’t really done that well cinematically since the 3rd Christopher Reeves movie. Superman has fared much better on the small screen, with Lois & Clark: The New Adventures of Superman, and Smallville, and the Cartoon Network shows Superman: The Animated Series and Justice League; their version of Batman also seemed note perfect, as did Batman Of The Future. The Arrowverse, as it has come to be known, which encompasses Arrow, The Flash, Supergirl and Legends Of Tomorrow has also been a critical and commercial success. Gotham, which may be off in a pocket universe of its own, has been pretty consistent. The DC Cinematic Universe flounders though. Henry Cavill’s Superman seems to be directed by someone who doesn’t like Superman (I admit it took Grant Morrison’s run on the comic to get me to like it). Ben Affleck’s Batman is not universally liked. Their joint movie spawned the viral Sad Affleck, which seems as good a commentary on a movie that was muddled, and failed, where Avengers has succeeded, in dividing the screen time between the top billing heroes. Suicide Squad seemed to suffer problems in the editing suite, where it was re-cut to capitalize on the lighter feel in other hero movies, and ended up not satisfying anyone really. Wonder Woman is the only cinematic outing that really ticked all the right boxes, and Gal Gadot was rightly seen as the shining beacon in the Batman/Superman movie as well. No one talks about Green Lantern. For some reason the choice has been made not to link up the TV series with the movies, which is a little odd. I haven’t seen the Justice League movie yet, but it was strange not seeing Grant Gustin as The Flash. Wonder Woman apparently shines again. I’m not sure about Aquaman and Cyborg. It’s supposedly business as usual for Cavill and Affleck – so, depending on your point of view that’s either great or terrible. So, what is the issue? It’s not like there is a shortage of story material – look at either universe, and any fan knows that there has barely even been a dent on the stories available from the canon. Batman has had critical run after critical run – Tom King succeeds Scott Snyder, the most successful writer on the book since Grant Morrison. Wonder Woman has had JM Straczynski, Brian Azzarello, and others. Suicide Squad really knocked it out of the park with Ales Kot. Superman has had Grant Morrison amongst others writing for it. The brilliance of the writers and the artists who helped design the worlds they operate within, maybe if they had been consulted might have been able to give some pointers, given that every year or so they have a huge event where they reboot the comics universe. Don’t get me wrong – I don’t hate the DC cinematic output – I really want it to work better though. I read more DC Comics than Marvel, and it’s painful to see them missing the mark. Superman Vs. Batman channelled a bit of Frank Miller’s Dark Knight but didn’t commit. Suicide Squad should have let the crazy rip. If Superman’s director really suffered through Superman to get to Batman, it was a mistake to keep him on. Batman and Suicide Squad make sense as being dark and brooding, but Superman is missing something if that’s all that you are seeing in him. The Marvel films have been very deft at straddling the line between drama and comedy, and they really wouldn’t work so well if there wasn’t some light in the darkness. There have been a few wrong steps – casting Tilda Swinton as the Old One got some criticism for whitewashing, and the Hulk really hasn’t bitten as a franchise in its own right. Oh, and Fantastic Four – Roger Corman, Chris Columbus, Tim Story, and Josh Trank all struck out. But all in all Marvel has done more right than it has done wrong, and it would seriously need to bungle the next raft of movies to slow that roll.